Materials: Limestone, concrete, seashells, broken pottery, marbles. This grotto was built inside the limestone basement of a privately owned home in Galena, IL by a woman named Olivia Perrault probably during the 1930s. I was lucky enough to hear about it through a Galena local, and as far as I know no other information has ever been published about this grotto. According to local lore, Olivia wanted to become a nun but was very unhappily unable to realize this dream and became very reclusive. Nevertheless she was spotted in her later years dressed in a nun's habit walking the streets of Galena as a somewhat disturbing presence and was thus dubbed "Mary XYZ". This grotto contains stones, shells and various ceramic and glass pieces. There are also numerous ledges with upturned seashells that I like to imagine were used as votive candle holders. It's easy to picture the grotto lit only by the atmospheric flicker of candlelight being used a meditative prayer chamber. My favorite spot is a windowsill containing a collection of marbles surrounded by many small pieces of weathered glass points and stone orbs. 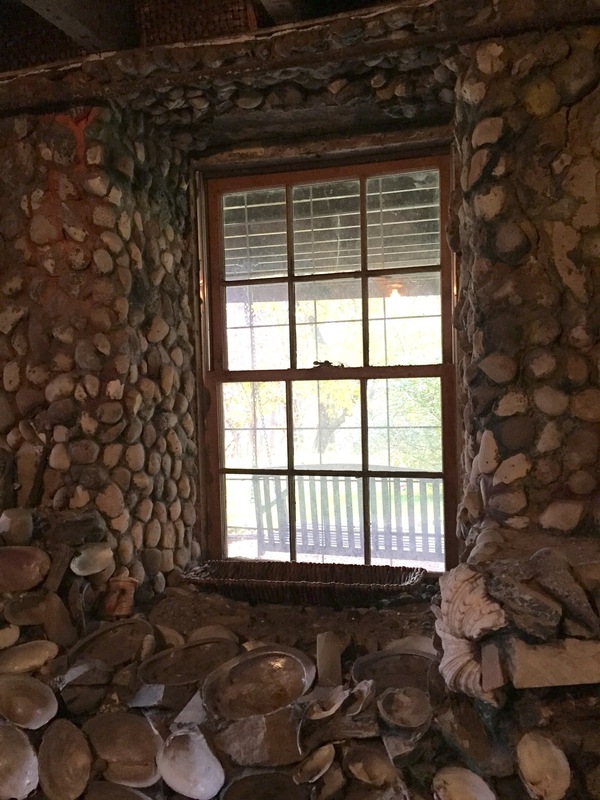 The home's current owners are planning on preserving the grotto and are currently using the room as a home gym.